In a series of three posts we share feedback from other senior-level marketers on why marketing automation is needed, benefits of marketing automation, and highlight their lessons learned from using marketing automation. This post covers the lessons learned from marketing automation. 1. As mentioned above, a SLA will help you define your process and plan while revenue generation software will help you execute that plan. 2. When it’s time to get buy-in from sales and executives it’s important to convey the benefits of using marketing automation technology to each respective group. This data is a true testament from other marketers. Additionally, we wrote this article which talks about the benefits of sales and marketing alignment, which executives will like. The broad benefit of this technology will not only help executives but will help sales and marketing as well. See our article on revenue generation for marketers and revenue generation for sales to learn more. The reason we don’t call it marketing automation software and instead use revenue generation software is because this technology helps multiple teams. At the end of the day, what is important is revenue generation, something all teams care about – or should. 3. When working with a vendor to integrate marketing automation technology, make sure you get good, intimate support to help with training and overall adoption. Adoption is an iterative process as features are consumed over time. 4. When finding the right set of features to use, don’t be overwhelmed. There are a lot of capabilities within marketing automation. It’s vital to start small and think big. For example, start with a simple demographic lead scoring campaign. Alternatively, start by using lead distribution or lead response features to automatically deliver leads to sales and respond to inquiries. Next, progress to advanced nurturing campaigns that trigger off of changes in a lead’s activity and interest. We hope this data on the needs, benefits and lessons learned of marketing automation were helpful. If you’re interested to hear how you can better align sales and marketing teams, gain control over marketing programs, measure marketing effectiveness, and strengthen your sales pipeline contact Lead Liaison. Our revenue generation software includes marketing automation as well as lead generation and sales prospecting technology to help your business. We welcome your feedback, comments and suggestions. 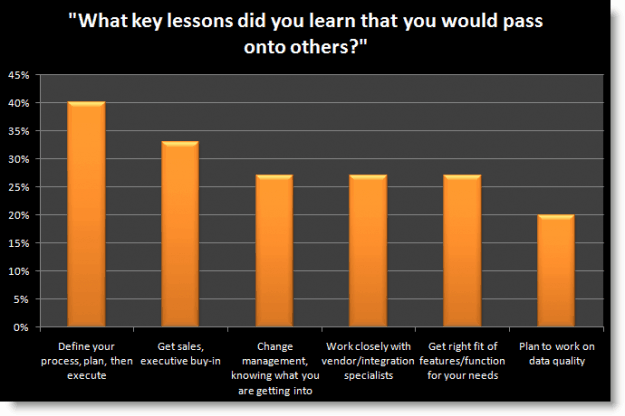 What lessons have you learned from using marketing automation? To be alerted of future posts, please click on the RSS button. Feel free to read part one, need for marketing automation, and part two, benefits of marketing automation.